During the last decade there has been a decline in elephant numbers in the Milgis Lugga and Ndoto Mountains which forms the northern range for the Samburu-Laikipia elephant population and a migratory corridor for elephants between Samburu and Marsabit to the north. Other rare and endangered species in the Ndotos and Milgis area include Grevy’s Zebra, African Wild Dog, a relict population of DeBrazza Monkeys and other mammals endemic to Northern Kenya such as Gerenuk, Reticulated Giraffe and Beisa Oryx. 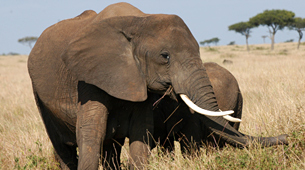 Commercial ivory poaching of elephants remains a real threat in this part of Kenya due to its proximity to illegal ivory markets in Ethiopia and Somalia, and the large number of illegal firearms in the hands of local people. Formal structures for protection and management of wildlife by government institutions in this area are extremely limited due to lack of manpower and resources. Therefore it is essential to engage the local communities in wildlife conservation to ensure the existence of many species in the long-term. The area of land under community-based conservation management in northern Kenya is increasing as communities become aware of the benefits that conservation can bring to them through alternative income generation, improved security and improved land management. It is widely recognized that it is vital to involve local communities in conservation to retain an ecosystem approach to conservation through the protection of large areas of land, allowing for the continued migration of wildlife through their natural range. This is particularly important for species such as Grevy’s Zebra, African Wild Dog and Elephant that have large home ranges and require access to vast tracts of land. The long-term conservation of wildlife in northern Kenya depends upon the support of local communities and a collective approach between communities, government and non-government organisations to improve security for wildlife and enhance livelihoods for rural people who share their land with wildlife. The benefits of these community conservation initiatives are becoming apparent as they create an enabling environment for economic development including tourism and improved livestock marketing. community conservation projects, the Kenya Wildlife Service, Kenya Police and Lewa Wildlife Conservancy to ensure effective response to security breaches.